So like your average cretin, I wasn't really that bothered about visiting the Athabasca Glacier. The only ice I was interested in by that point was the ice cream I'd be getting towards the end of the trip at the Ben & Jerry's factory (I think Michele genuinely, genuinely considered breaking up with me over this fact - genuinely). However by the end of the day, I was left thoroughly impressed - and there are about 1,000,000 photos coming your way to prove it! We got ourselves wrapped up as best as we could, heeding warnings that it was only gonna get colder as we climbed the glacier. Unfortunately, we had optimistically packed for summer. I mean, it was basically August by that point, you don't really expect to have to take a ski jacket! Luckily, the company that took us on a guided walk across the glacier had all the right equipment to lend us an extra few layers! Looking incredibly stylish in our new padded silhouettes, we walked to the toe of the glacier, passing various signs along the way that indicated where the glacier had started from at particular points in time. 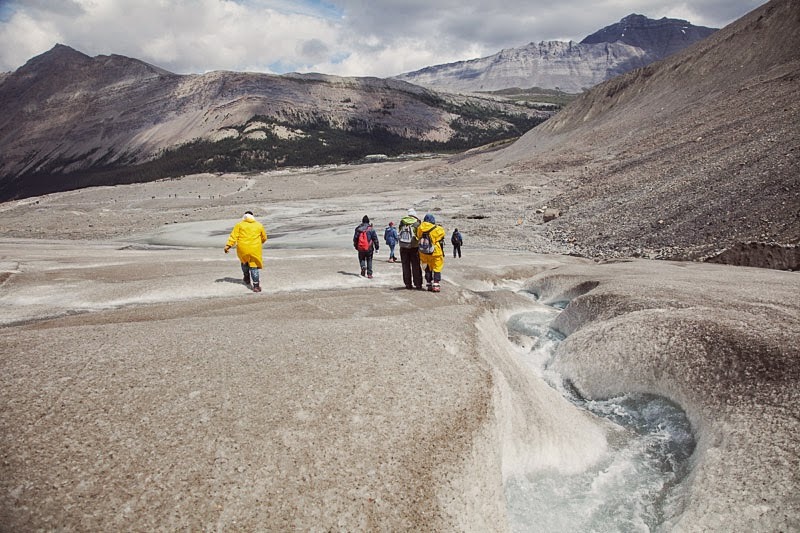 Although the glacier is slowly sliding down from the ginormous Columbia Icefield (which is giantly huge and something I'd really love to see from the warmth and safety of a helicopter), it's also receding due to global warming. Before stepping onto the glacier, we were all given a brief health and safety talk (i.e., don't wander off because you will fall down an ice hole and die) before crossing over to the ice via a pirate-style plank. Then it was crampon versus hiking boot wrestling time and away we went! The ice surface was incredibly gritty and quite dirty looking. Apparently this is due to all of the pollution blowing up the mountain pass - it all melts off and gets washed away though before being covered by a fresh layer of snow in the winter. Walking across it with our crampons on felt like stepping on frozen gravel - not slippery at all! Our guide hacked away at the grimy outer layer of the ice and revealed fresh, baby blue ice below. He passed us each a piece of crystal ice to look at. We were told that the glacier is around 5000 years old which is comparatively young apparently! Scientists come to analyse the ice at different depths - as air bubbles were trapped in the ice during the glacier's formation, you can tell a lot about the atmosphere of past centuries (and even millenia) by taking the ice back to the labs for analysis! Now back to those ice holes you could fall down and die that I alluded to beforehand. I wasn't even kidding, these things are genuinely lethal. If the fall doesn't kill you, you'll freeze in the barely-thawed waters before the emergency teams can get you out. The message of the day was: DON'T GO ANYWHERE NEAR THEM. We were told to tread only where our guide trod in case we stepped on some fresher snow disguising a weak ledge in the ice. It was absolutely terrifying, especially when we peered over the edge (held securely by our guide) and watched the meltwater hurtle past the aqua into the midnight blue and beyond into total darkness. The thing that freaked me out the most was that they looked exactly like a nightmare I had as a small child in which I found a similar ice tunnel in my sister's bedroom and when I peered in, there were dragons inside (which looked very much like the hooden horses of Kent's folklore). But nevertheless, it was still very chilling (geddit?!) to be so close to pretty-much-certain death! A cold wind nipped down the mountain pass and curled its way through our thermal layers. Even with a hat on and two hoods pulled up around my hat, my ears were still freezing cold. Snows had fallen there recently, making some spots even more treacherous than usual. Whilst the ice has been compacted over the years, the snow is much weaker and can form unstable bridges across ice wells and pits. One step in the wrong place and you'd be plunged down to an early, icy grave. You can see the difference between the ice (blue) and snow (white) in the photo above. Our guide gave us a little talk about the way the cracks form in the glacier. I wasn't listening too closely because he was demonstrating it with a Mars bar balanced on his hand and I was hungry. We felt like we'd been walking for ages; the Icefield seemed so close! Yet we were still a good few kilometres away and it was time to start slowly making our way back to solid ground. I can't take him anywhere without him finding a bro to bromance with. Strangely enough, this was once the pit of one of those scary ice holes when the ice was built up much higher than it is today. Of course the ice melt brings all the debris with it and it gets deposited in these little holes and all is revealed when the glacier falls away in the heat. Before long, we were making our way back across the grimier ice and it was time to kiss the glacier goodbye. We took our crampons off and tried to learn to walk on solid ground again. Everybody absolutely loved the glacier walk - if you ever get the opportunity I would thoroughly recommend it - you won't have another experience quite like it! We bumped into another Trek America group who were just about to go on the walk themselves and babbled on about how amazing it all was. And as for me - did the walk change my mind about the glacier? Let's just say that suddenly, that Ben & Jerrys visit didn't seem quite as momentous after all! I seriously got chills seeing the photos of the ice holes! YIKES! As cool as walking on a glacier would be, those totally freak me out. D: It looks so gorgeous, though! 5000 years young! Insane! These photos look like a painting - looks like such an incredible experience!!! Equal to ben and jerry's if you ask me :P Makes me want to visit some glaciers!